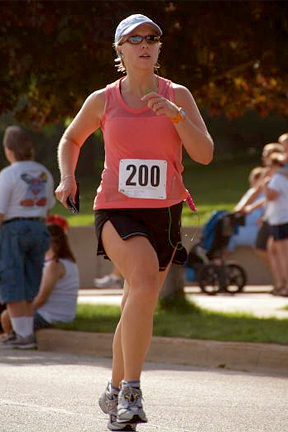 I found your blog on the Running Blog Family listings & have been enjoying it! Hi, Sarah--it's great to meet you...and I see you are a fellow Michigander, cat lover, wine drinker, AND registered for your own very first Marathon this Oct. (I stalked your blog, heh). Excellent! I added your blog to my reading list. It will be fantastic to follow along with someone else's training. Do you have a specific plan you are going to follow? I kind of cobbled together an 18 week plan that takes the highlights of about a half-dozen different plans. Training starts June 1. I wanted to do Grand Rapids (I think that's the same day as Detroit), but hubby won't be around that weekend, so I'm instead doing Milwaukee the first weekend of Oct., since my family can come cheer (I'm originally a Cheesehead). High mileage week and got to meet/have dinner with two RA'ers! Very good week for you. I was already thinking I wanted some mexican food tonight with it being Cinco de Mayo and then you go and mention Tex-Mex.... man, my mouth is watering. I say since it's 5/5 that you do it, anyhow, Alan! :D Now I'm thinking maybe I should have DH pick up taco ingredients at the store for supper...or maybe we could make taco pizzas with all of the expired tortillas he bought cheap, recently.